The roomy quick-pitching Klondike Grande provides excellent levels of comfort for up to nine people. The vertical door makes for easy access – especially in bad weather. Protective eaves run around the tent to shelter door and walls from rain run off. The zip-in groundsheet features a zip to the centre alloy pole, enabling it to be rolled away to create a safe area in which to use an optional tent stove and a place for muddy boots. 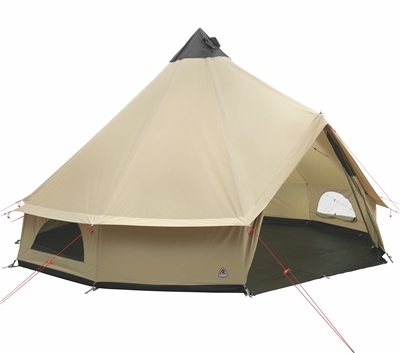 The bell tent features the neat new Internal Apex Vent Control that can be easily opened from inside using just two cords neatly channelled along the walls.